Why are we starting with forehands? 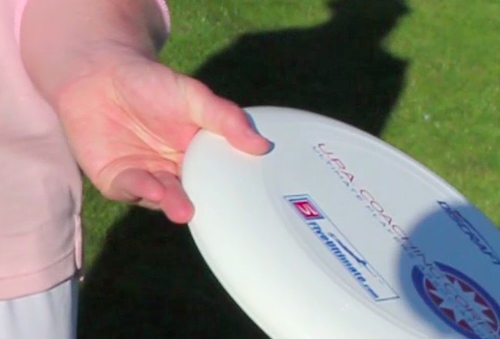 90% of the time you have the disc in your hands, you should be in a forehand grip. The sooner you get comfortable with it, the better. I strongly suggest you download the video (that means you need to register for a free Vimeo account). There are a lot of things you can see more clearly when you watch frame-by-frame. The pad of your middle finger goes in the grove between the rim and the underside of the disc. Your index finger rests next to your middle finger on the underside of the disc. Grip the disc on top with your thumb pointing towards the middle of the disc, and with your ring finger on the outside of the rim. In your neutral stance, hold the disc in a tight forehand grip with your arm at your side. Your feet should be flat on the ground about shoulder-width apart, with your weight slightly shifted to the balls of your feet. 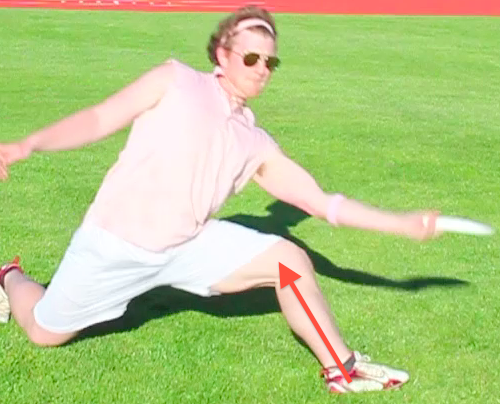 This stance puts you in the best position to quickly throw any throw. Step out and forward and plant hard on your heel. 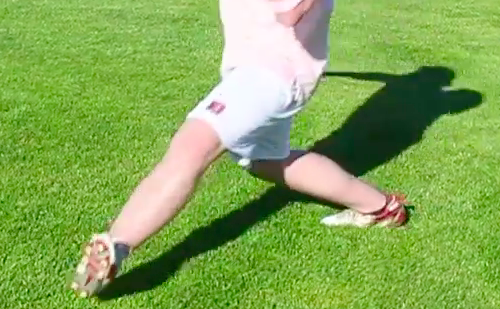 As you complete your throw and follow-through, your lower body should stay almost motionless. 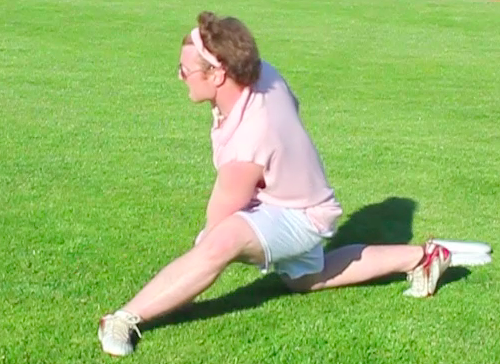 You should be externally rotating your foot and making sure that your shin points back towards your body. Marking is protecting the break side. No fake. I just step out and throw quickly enough and with enough extension that the marker is nowhere near the release point. I do a very small shoulder fake. I do a slightly bigger shoulder fake. I get the marker moving to protect the backhand side as I'm already moving to throw the forehand. When you need to move the mark to throw a forehand, this is what your fake should look like. Gspence does a pretty exaggerated shoulder fake. 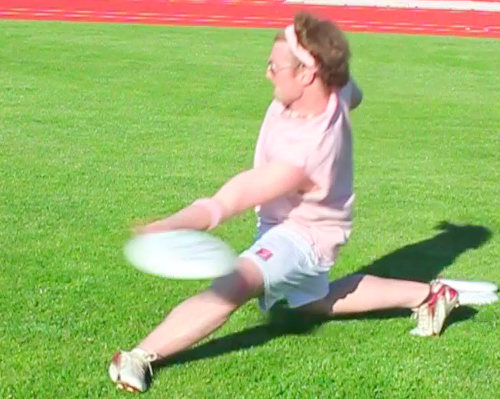 He'd be better off starting in a narrower stance, and keeping the disc by his side instead of bringing it across his body and touching it with his other hand. There are very few situations where it is a good idea to pivot across to a backhand to set up your forehand. 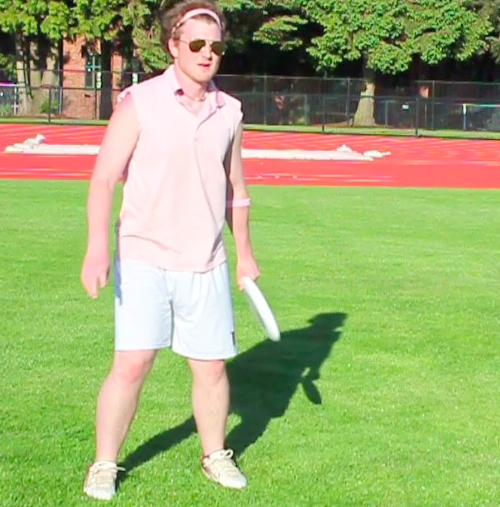 Throwing an open side forehand is never one of those situations. In the time it takes Gspence to pivot back and forth, the marker can easily recover to his original position. Gspence doesn't mess around and just steps out and throws the open throw. Again, I suggest going through these frame-by-frame to get a better idea of what's going on.